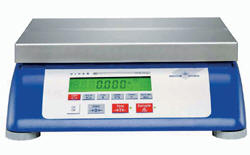 The Mettler Toledo parts scale we purchased a few months ago has measured up to all our expectations. We are now able to weigh items up to 120 pounds and this is something that we could not do with our old mechanical scale. The digital feature makes it easy to read what each parts weigh thanks to the large screen and font size.